Can you believe its been almost 2 years since my last post! I would love to tell you that I’ve had life changing news or that I’ve been travelling the world, but the truth is that I started a new job and well… life just got in the way. But I’m back and hope to kick off where I left off. I have to admit I’m little rusty with my photography, and my writing hasn’t really improved much either but I hope to bring you some really yummy recipes that will delight your eyes and tummy. I’ve started with something that I love love love. Samosa!! Who doesn’t love a samosa, not the big thick pastry style samosas but the dainty homemade thin pastry style samosas that I truly believe only my Mum can make. So as Mother dearest has been in India and visiting family I thought the only way to satisfy this craving was to pull my finger out and make them myself. 4 cardamon pods, seeds taken out. 400g potatoes, peeled and diced into 1cm cubes. 1/2 inch of ginger , grated. 1 large garlic bulb , crushed. 1 tsp secret ingredient …ok ok .. it’s Mango chutney .. but who’d a thought! 1 tsp of melted butter. Pre heat the oven to 250 degrees C.
Boil the potatoes until tender and then add the peas and cook for a further 30 sec to a minute. Dry toast the coriander, cumin and coriander seeds in fry pan over a medium heat for about a minute taking care not to burn. Coarsely grind the black onion seeds using a pestle and mortar. Heat the oil in a fry pan over a medium flame and fry the onion until soft. Add the garlic , ginger and chilli and fry for a further 30seconds. ( I actually used a 2 tsp of ginger and chilli mix I keep in the freezer for recipes like this). Add the spices and let cook for a further 1 minute. Add the potatoes and peas and mix well . Let cook for another 4 mins and stir frequently. Take off the heat , add the secret ingredient ( Mango chutney ) and the chopped coriander. Stir and season well. Lay a sheet of the filo pastry on the work surface and brush with melted butter , lay another sheet on top. Cut into strips 7cm wide then brush lightly with the melted butter. Put a spoonful of the mixture onto the top left hand corner of each strip and fold over and make a triangle. Continue to fold down the length of the strip to completely encase the filling and the melted butter will help smooth down the melted edge. Repeat until all the filling and pastry is used up. 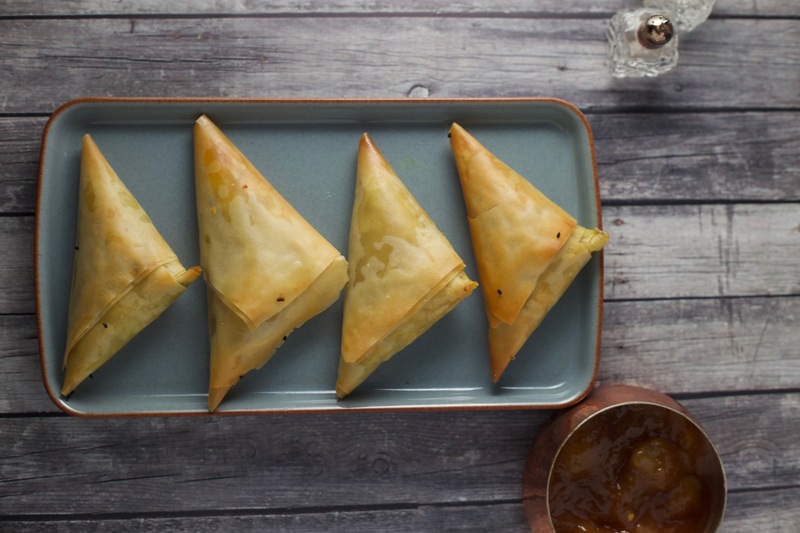 Arrange the samosas on to a baking tray and bake for 25 mins or until golden brown and crisp.